Delta Xtend™ Reverse Shoulder System focuses on external joints like shoulders as care device of Replacement / Reconstruction. This device is a sum of semi-constrained shoulder arthroplasty. It gallops the usual connection amid the scapular and humeral mechanism, rotating the scapulo-humeral joint center of rotary motion medially and inferiorly. By doing this, it augments the deltoid lever arm in addition to the deltoid stress consequently allowing the strength of the deltoid group to recompense for the rotator cuff shortage. The Delta XTEND™ humeral stalk is premeditated for the paved obsession. The glenoid part is bolstering less with four coil as key fixation and HA wrapping for minor obsession. O sistema reverso do ombro de Xtend™ do delta focaliza em junções externas como ombros como o dispositivo do cuidado da recolocação/reconstrução. Este dispositivo é uma soma da artroplastia semi-confinada do ombro. Galopa a conexão usual entre o mecanismo scapular e humeral, girando o centro comum scapulo-humeral do movimento giratório medially e inferiorly. Fazendo isto, aumenta o braço de alavanca do deltoid além do que o esforço do deltoid que permite conseqüentemente que a força do grupo do deltoid recompense para a falta do punho de rotator. A haste humeral do delta XTEND™ é premeditado para a obsessão pavimentada. A parte glenoid está amparando menos com a bobina quatro como a fixação chave e o HA que envolvem para a obsessão menor. The DELTA XTEND System is a total semi-constrained shoulder arthroplasty. It reverses the normal relationship between the scapular and humeral components, moving the scapulo-humeral joint center of rotation medially and inferiorly. By doing this, it increases the deltoid lever arm as well as the deltoid tension therefore allowing the muscles of the deltoid group to compensate for rotator cuff deficiency. Each design feature of the Delta XTEND Reverse Shoulder System was chosen to accelerate recovery, optimize function and maximize survivorship. The DELTA XTEND Shoulder Monobloc Humeral Stem is designed for cemented fixation, while the Modular Humeral Stem is designed for cementless fixation. 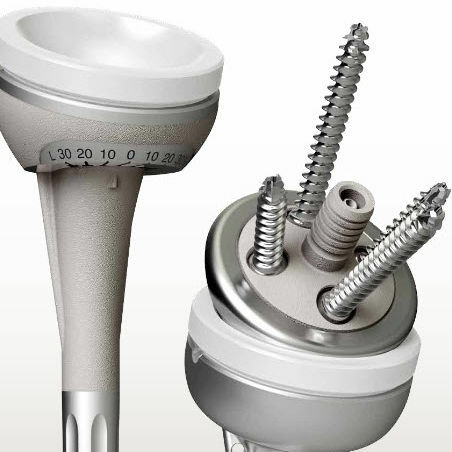 The glenoid component is cementless with four screws as primary fixation and HA coating for secondary fixation.